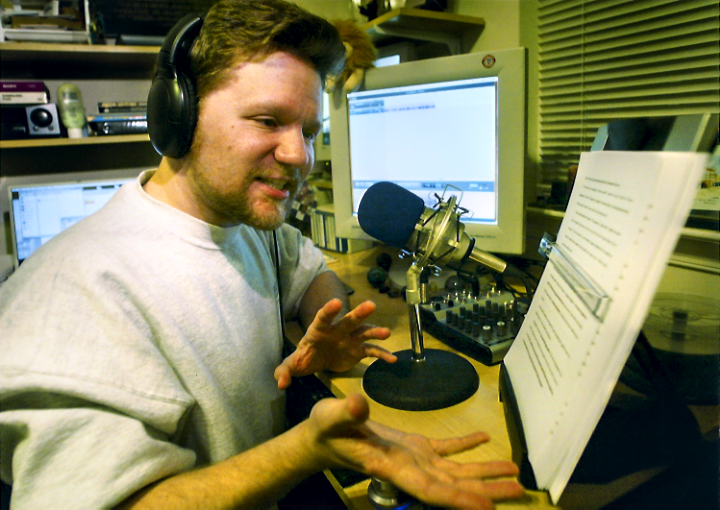 This is me, six years ago, recording Morevi: The Chronicles of Rafe & Askana. Evo and his on-pod partner Mike Mennenga, at that time, hadn’t been podcasting for long. Only a few months. It made sense, though. Their podcast was all about books, and all about Science Fiction and Fantasy. Have an author podcast a book on their Dragon Page feed. Sure. Why not? Six years ago, Mike Mennenga patiently walked me through the process of hooking up a mixer to my PowerMac G4. My first rig, including the iLife package that included GarageBand, was an investment of $400. After making sure the cables were plugged into the right inputs, the audio card was solid, and the MXL990 was hearing me loud and clear, I started recording. After roughly a week of recording, editing, and mixing, my first episode was ready for delivery. Six years ago today—January 21, 2005—the Prologue of Morevi went live on The Dragon Page’s RSS feed, beginning the first novel to be podcast in its entirety. This was a publicity stunt. A shot in the dark. A leap of faith, which ironically was the title of the Prologue. Shortly after I went live, author Mark Jeffrey stepped up and said, “I’d like to podcast my young adult novel, The Pocket & the Pendant.” Then along came a guy named Scott Sigler who wanted to release exclusively as a podcast his novel, EarthCore. In the midst of all these downloads from Dragon Page’s RSS feed, Evo coined the phrase “podiobook” and later launched Podiobooks.com. All this started six years ago. Today. And it hit me just this morning. Thank you, authors and listeners alike, for coming along with me on this unexpected journey. Thank you Tee, for everything you’ve done in this space. Thanks for starting something I’d be lost without Tee and Evo. Tee, you know as I’ve said it before, your stories grok with me at a fundamental level. Thanks for doing what you do and never giving up. I’m so glad you’ve got new fiction coming down the pipe. I can hardly wait. Trailblazing is never easy but you have done a fanatastic job of it. Many of us who have followed have only done so because you set such a shining example. Thank you for being there Tee and creating something wonderful. Something I feel priviledged to be part of, both as a listener and as a podcaster. Your stories were creative, well-produced and thoroughly enjoyable. I hope I can do half as well. Thanks so much for the awesome ride … a ride that I’m sure is far from over. You’ve contributed so much to podcasting and podcast novels, it’s hard to imagine what it would be like without your efforts. I’m glad we didn’t have to find out. I remember that. It feels like such a long time ago. I can still put myself in that “oh my god what is this free radio internet stuff?” moment. It’s why I keep coming back. Thanks for getting the ball rolling, oh bearded one. I don’t know how many people will admit it, but Sarge, you were an inspiration to me. I remember the day the prologue dropped and thinking “I’ve got to do that with one of my books!” It took me years to do that, and I’m glad I did. For everything you have done and are sure to do in the future, Thank you! Thanks for… I don’t even know what to thank you for first. Helping me choose a mixer. Sorting me out with the MXL 990. Getting me to my first con. Being around to answer every stupid podcasty question I have ever had. Not getting annoyed at Every. Single. Audio. Issue. we had every time you were on my show. Introducing me to the wider Podcasting community. Not dismissing me as a kid when I was a 14 year old. Making me feel so welcome in your home. Being instrumental, even if you didn’t know it, in me going to D*C, and probably going again this year. Trusting my friend, who you had met for less then 20 minutes, to play with SB [Hearing the screams of “Rock! Paper! Scissors!” from the back of the car is still one of my most vivid memories of that trip, competing with interviewing Edward James Olmos, walking the D*C parade with the Technorama guys and getting an insider tour of MIT. Inspiring me, at least once, to go out on a limb and write a deeply personal blog post. Encouraging me, at every single turn. In short, thanks for being you, and I can’t WAIT to see, hear and read what the next 6 years bring! All kidding aside, it was an insanely great idea, and I’m glad you stuck with it. I look forward to reading your new book, and to hearing you on pod again. Keep up all the great work, Tee. You continue to be a source of inspiration to a lot of us. Thank you for starting something that so many of us find an integral part of our daily lives. I remember all that, from the listener side and I have to say I’m grateful for everything the tribe has brought about. Without all of this, and more importantly the community there would be a big part of my life missing, and I only just started podcasting myself this month. As a listener I can say that the tribe has done wonders. Morevi and John Lenahan’s Shadowmagic were the first books I downloaded off of Podiobooks.com. I think it may have been after listening to a dragonpage episode too … Gosh that was a long time ago.